It seems we have come full circle in how we manufacture goods. Before the arrival of machinery everything had to be made by hand using limited tools and equipment. The industrial revolution hit, goods became mass produced and this often made them less expensive and better quality. This grew and grew until mass produced became too mass market and there was a return to quality handmade goods. The great thing is, that because of the industrial revolution the craft worker now had better tools and could not only rival the quality of mass produced goods, they could better it. 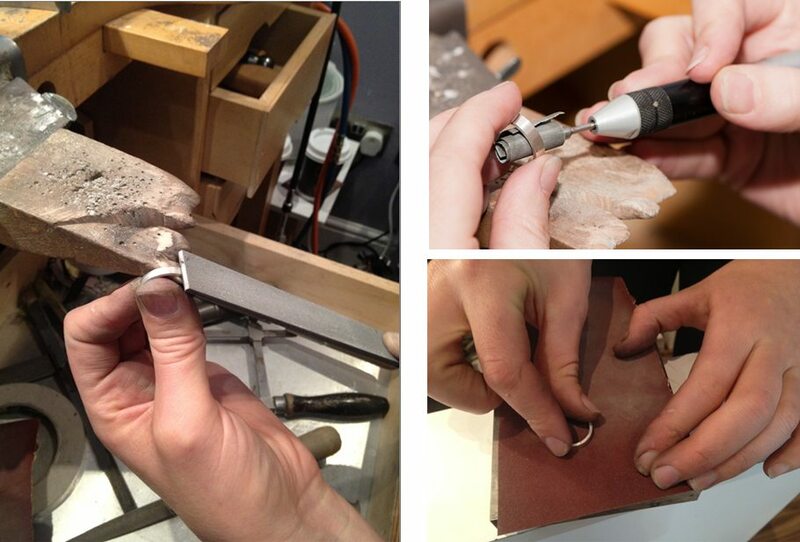 So what is handmade jewellery and how does it differ from mass produced? 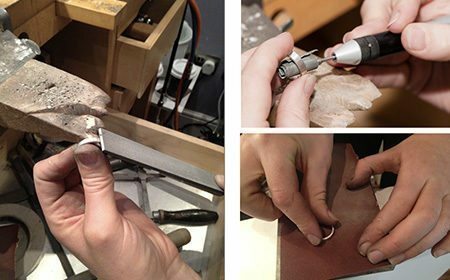 Below is a photo gallery of the process of making an engagement ring by hand and then an explanation on how mass production in jewellery is carried out. Most people are surprised to hear that in the case of a handmade ring we start with a bar or sheet of metal rather than a crucible of molten metal…. The metal is prepared by being cut or milled to the correct size and then is turned up into a ring shape using half round pliers. 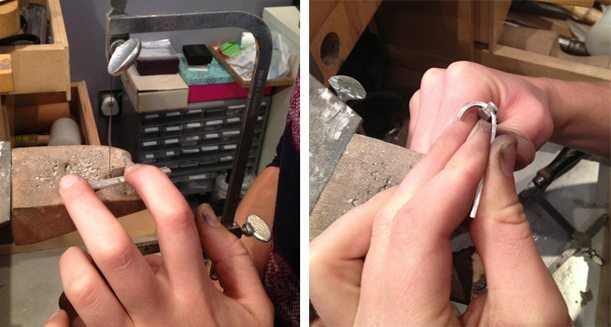 The ring is soldered – fused together using silver with a slightly lower melting point than sterling silver. It is then hammered until it is a perfect round on a steel tapered mandrel. 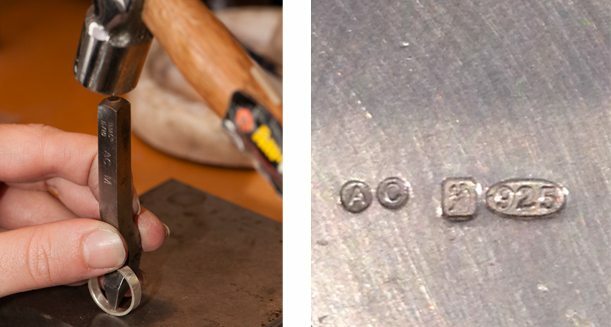 The ring is stamped with a makers mark, in my case AC, and then goes to the Assay office to have 925 for sterling silver and the Dublin mark stamped in it. The ring is then filed and sanded using 4 grits of sandpaper from coarse to very fine before being polished. 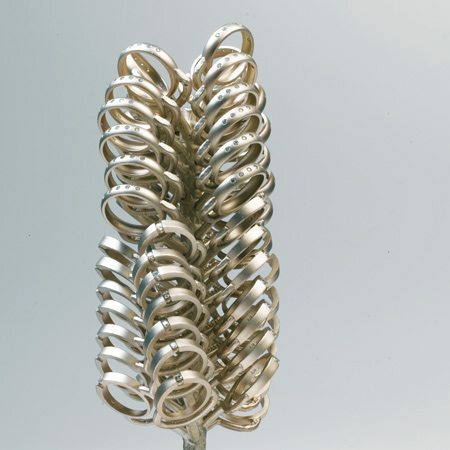 A ‘Casting Tree’ – illustrating how rings are mass produced. Hopefully it is clear that it takes quite a bit of time and that is for a simple plain band! So what about mass produced rings then? Below you will see a casting tree which shows how rings are mass produced. A mould is made and then injected with hot wax. The hot wax fills the mould and creates wax replicas of the ring. These are then all put together in a flask and the wax is covered with a liquid that is similar to Plaster of Paris. Once this has solidified the wax is burnt out leaving a cavity in the shape of all of the rings. Molten metal is then poured in to this cavity. I have noticed a huge shift in how people spend their money in the past 5 years in Ireland. Customers are no longer happy to spend money without a second’s thought on ‘Made in China’ labels. We want value for our money now, a story behind the product, to meet the maker and most importantly to support local enterprise. There are not a lot of positives to take from our recent history, but this shift is most certainly one!